Surgical data science is a new research field that aims to observe all aspects of the patient treatment process in order to provide the right assistance at the right time. Due to the breakthrough successes of deep learning-based solutions for automatic image annotation, the availability of reference annotations for algorithm training is becoming a major bottleneck in the field. The purpose of this paper was to investigate the concept of self-supervised learning to address this issue. Our approach is guided by the hypothesis that unlabeled video data can be used to learn a representation of the target domain that boosts the performance of state-of-the-art machine learning algorithms when used for pre-training. Core of the method is an auxiliary task based on raw endoscopic video data of the target domain that is used to initialize the convolutional neural network (CNN) for the target task. In this paper, we propose the re-colorization of medical images with a conditional generative adversarial network (cGAN)-based architecture as auxiliary task. A variant of the method involves a second pre-training step based on labeled data for the target task from a related domain. We validate both variants using medical instrument segmentation as target task. The proposed approach can be used to radically reduce the manual annotation effort involved in training CNNs. Compared to the baseline approach of generating annotated data from scratch, our method decreases exploratively the number of labeled images by up to 75% without sacrificing performance. Our method also outperforms alternative methods for CNN pre-training, such as pre-training on publicly available non-medical (COCO) or medical data (MICCAI EndoVis2017 challenge) using the target task (in this instance: segmentation). As it makes efficient use of available (non-)public and (un-)labeled data, the approach has the potential to become a valuable tool for CNN (pre-)training. We acknowledge the support of the European Research Council (ERC-2015-StG-37960). 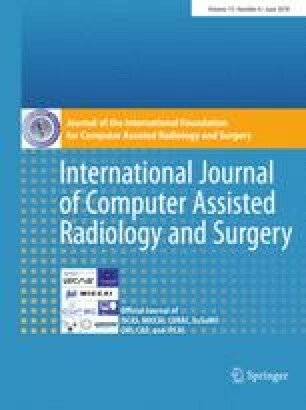 This work was support by Intuitive Surgical who providing us with the raw video data, from which the Medical Image Computing and Computer Assisted Intervention conference 2017 robotic challange data were extracted. We further acknowledge the support of the Federal Ministry of Economics and Energy (BMWi) and the German Aerospace Center (DLR) within the OP 4.1 projekt. Finally, we would like to thank Simon Kohl inspiring us to this paper. This article contains patient data from publically available datasets.